Printing body parts? It sounds like something straight out of science fiction. 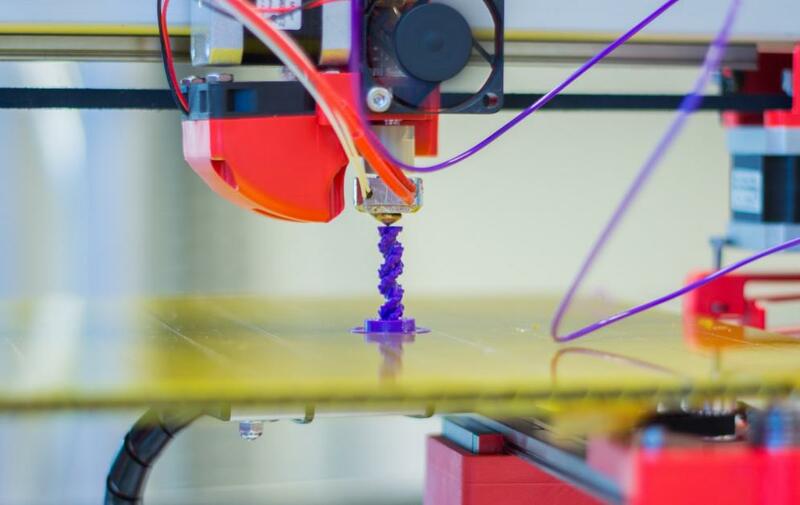 Thanks to advancements in 3D printing technology, though, printers are capable of doing just that, and more. From artificial limbs to Olympic running shoes to houses, the applications of 3D printing are seemingly endless. Liquid ultraviolet curable photopolymer resin: The printer’s laser traces a cross-section of the pattern onto the resin. The light cures the resin, bonding it to the layer beneath it. Inkjet technology: 3D printers apply drops of ink layer-by-layer that are hardened by UV light. Binder jetting: The printer uses a powder-based material that is glued together with a binding agent. Excess powder is blown off at the end of the process and can be used to build the next 3D object. Fused deposition modeling (FDM): A plastic or metal wire is fed into the printer on a coil and then melts and hardens as it builds the object. No matter the printing method, each 3D object must first be designed in CAD software. The most common application for 3D printing right now is rapid prototyping. Engineers and designers can print out a prototype in mere hours instead of waiting weeks. Automotive companies can print engine parts. Architects can print scale models. Shoe designers can print an athletic shoe. One of the most exciting areas for 3D printing is healthcare. Medical professionals have been able to use the technology to produce artificial limbs for a fraction of the cost. Also, so-called “bio-printing” takes layers of living cells and places them onto a gel medium that can be slowly built up to a 3D structure. How will it influence our future? Growing organs from stem cells would have enormous impacts on the future of healthcare. It may have significant effects on commerce, as well, as people will be able to print their own objects instead of purchasing products from others. The aviation industry is experimenting with printing airplane parts, which could make flying cheaper and more environmentally friendly. New printing technology continues to improve. 3D printers are getting better, faster, and cheaper, while also including an ever-expanding list of usable materials. With more than 40 years in the printer industry, Pacific Office Automation has seen printing technology change and improve. A printer no longer just merely prints: it scans, faxes, copies, acts as a virtual records management system, and produces vivid, print shop-quality graphics on a variety of materials. Pacific Office Automation partners with the most innovative manufacturers in the industry to bring our customers cutting-edge products and software solutions. Contact us today for a free workflow analysis, so we can match your needs with our customized solutions.